If you're good at forming an instant picture of a movie by the terms used to categorise it – and frankly most of us are – then here are three that should get you started: animation, horror, anthology. If you want to get really pre-judgemental you can add another one: French. That's despite the fact that two of the short films that make up the complete whole here were directed by American artists. But all of these descriptive nouns are accurate and appropriate, as Fear[s] of the Dark is an animated horror anthology, and yes, it contains many of the things – both positive and negative – that we tend to associate with those categorisations. 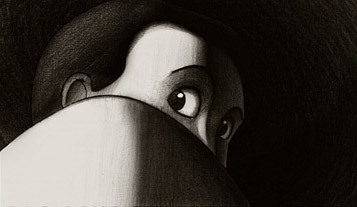 The concept behind the film was to invite six internationally acclaimed graphic artists to explore the notion of fear of the dark as an animated short, with the stipulation, one presumes, that each film had to be in monochrome (there is a splash of red in one story). Most of the artists play a little loose with the brief (though four of them do at least incorporate it into their stories) – what all six tales do explore to some degree is the more general concept of fear in one form or another. In one case the dark is just about the only thing the central protagonist appears not to be afraid of. Presumably in an effort to vary the traditional multi-story structure a little, two of the stories are broken up into segments that play out in the pauses between the other four, which with one exception play uninterrupted. The wisdom of this fragmentation strategy has been called into question, but it does neither of the broken stories any serious harm, given that one of them is episodic in structure and the other...well...I'll get to that in a minute. After a rather nifty opening credits sequence and the sort of title tune that burrows into your brain, the two segmented tales get under way. The first is set in times past, where an evil-minded nobleman traverses the landscape with four angry dogs, three of which he lets individually loose to attack innocent parties – a blind boy, a local peasant and a female dancer – whose suffering he delights in, while the fourth has his eyes on a different prey. In the second story a woman relates her fears and anxieties, both personal and social, while abstract shapes form and mutate on the screen. The fourth tale features young Japanese schoolgirl Sumako, who is receiving clinical treatment for disturbing dreams that she is being encouraged to see through to the end. In them she arrives as a new pupil at a school in which she is taunted and beaten up by her classmates, then finds herself terrorised by a variety of Japanese demons, apparently under the guidance of Hajime, the ghost of a samurai who committed suicide in the house where she now lives. Number five sees a man make a chance visit to a region in which he spent his boyhood summers and recall a time when the region was terrorised by a monster, one that claimed amongst its victims the man's uncle and possibly his best friend. In the final segment, a man takes shelter from the snow in an old and isolated house, where his initial relief soon gives way to unease as he suspects he may not be alone. With only an oil lamp to light the way, he begins exploring the building's dark and maze-like interior. Anthology films are tricky beasts to get right. Characters and plots cannot be developed to the same degree as in feature-length stories and rarely will they be of consistent quality – think of any horror anthology from Amicus and you'll likely be able to pick both a favourite segment and at least one that you felt wasn't up to scratch. Such is the case here, but with six stories separated not just by plot but also by visual and storytelling style, the difficulty of matching material to personal taste is complicated further. All opinions expressed here on the quality and effectiveness of the individual episodes are thus largely personal, but do seem to have found some concensus elsewhere. For me the film's weaknesses just about outweigh the strengths, but the strengths are still sometimes bold enough to justify the entrance fee. My least favourite has to be the second segmented piece, written and directed by Pierre Di Sciullo, which effectively constitutes an intellectual response to the brief. This is not a problem in itself (save for the fact that fear is primarily an emotional reaction), but having someone just spout a list of things that concern her in daily life seems to fly in the face of the visual possibilities that film has to offer, reminding me of the advice I was once given by a mentor, who told me never to rely on dialogue to tell him something that I could clarify visually. The shifting abstract accompaniment feels exactly that, and save for a few moments that relate specifically to the narration, it could easily be cut up and rearranged without significantly affecting your response to the words. That the woman may be talking to a psychiatrist and that she may even be doing so in the afterlife carries little dramatic weight. Blutch's tale of the dog-wielding aristocrat is, like all of the remaining pieces, gorgeously drawn and animated, but the story is slight and the political subtext obvious and a little heavy-handed, its conclusion a barely disguised allegory of revolutionary revolt. Fortunately for the film and the audience, the first uninterrupted story is a good one. 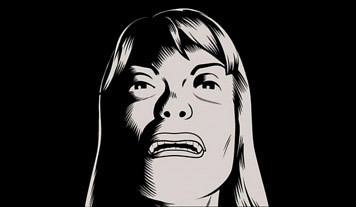 American artist Charles Burns' tale of a young man whose girlfriend begins a process of troubling emotional and gender transformation has a nicely EC horror comic feel (the story was actually based on one of Burns' own early comics) and an undercurrent of sexual politics that augments rather than overwhelms the story. A visually striking piece for its gorgeous pen-and-ink style imagery and smooth computer animation, it creates a most unsettling dream world atmosphere, assisted by Laurent Perez's creepy minimalist score. The story arc will have a familiar ring for the genre faithful, but it's executed with style. Marie Caillou's visualisation of a Japanese schoolgirl's relived nightmare is a bit of an oddity. Very effectively taking influence from Japanese artwork for its visuals, its strange collection of monsters are in fact all drawn directly from Japanese spiritual legend, although the schoolchildren are more European than Japanese in behaviour and appearance (well it is a nightmare...). The real problem is that it consistently appears to be heading for a conclusion that never materialises. Maybe there's some cleverly disguised final punch that eluded me here, but I will say that I'm not the only one who has been left scratching my head at the lack of anything that feels remotely like an ending. Style over content again becomes an issue in Italian artist Lorenzo Mattotti's story of a community living in fear of a monster in the marshland. It has at its core a sound enough proposal, that fear and superstition can build and and be fed by nothing more than a failure to look for a rational explanation, but that doesn't ease the sense of anti-climax that such a discovery brings, and even at 12 minutes the story that is here feels a little stretched. Visually, as ever, it's a treat. The best has been wisely saved until last, as American artist Richard McGuire takes a sheltering traveller on a creepy and vision-restricted trip through the darkened corridors of an old house in which danger may or may not lay waiting around every corner. Like his countryman Charles Burns, McGuire creates his images in pure black and white, but employs a minimalist, almost cut-out approach in which only the bare minimum of detail is used to suggest far more complex forms. It's a captivating technique that, coupled with engaging and expressive character animation (there's not a word of intelligible dialogue), transforms a simple story into a segment in which the original brief is most successfully and enjoyably realised. Fear[s] of the Dark is an interesting experiment that achieves partial if not complete success. Two of the episodes are weakened by a lack of story development, a third comes to an halt before delivering an ending and one talks about fear rather than exploring it. The design and animation are the key attractions here, and with the exception of Di Sciullo's interesting but art school-ish abstractions, the standard in this area is consistently high. Curious, though, that in this French animation project it's the American contributors who most satisfyingly deliver the genre goods. It's actually hard, I would think, to seriously screw up a transfer of a modern black and white animated film, especially one with a running time that leaves plenty of disc space free for a decent compression ratio. Fortunately Metrodome don't appear to be in the business of proving me wrong – the blacks are solid, the whites are clean and the greys when they appear are without digital issue. Edges and detail are crisp without obvious enhancement. Nice. The picture is framed 1.72:1 and anamorphically enhanced. You can choose between Dolby 2.0 stereo and Dolby 5.1 surround soundtracks, both in the original French. Each is clear and with a good dynamic range – the 5.1 track does make use of the surrounds for external atmospherics and boasts some good bass work on the low key score(s), but you won't feel cheated by the stereo track. An engaging interview with Burns conducted at The Witchery in Edinburgh (which could be haunted...oooo!) in which he outlines how he became involved in the film – his first experience with animation – but spends most of the time talking about his last graphic novel, Black Hole, which has already been snapped up by Hollywood, apparently with David Fincher attached to direct. A really worthwhile featurette that takes a fragmented look at the making of each of the films in sequence through their original artwork concepts, storyboards, line animations, animatics, voice recording and even footage of some directors acting out actions for the animators. 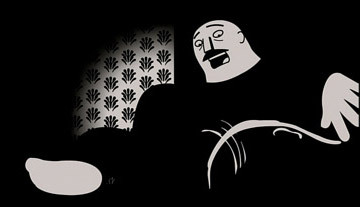 Particularly fascinating is the process of rendering Burns' animation as 3D computer imagery, which then had to then be simplified to produce the pen-and-ink effect of the finished product. A largely redundant collection of grabs from the film whose main purpose appears to be to identify which animator was responsible for which sequence. Concise Biographies are included of the key creative personnel, and there's also a UK Trailer (0:44), a brief but niftily cut affair that carefully avoids dialogue so as not to scare away the subtitle phobic, but also includes a few narrative giveaways. 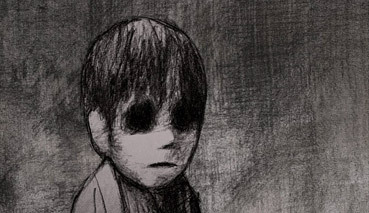 For the animation alone Fear[s] of the Dark is worth a look, and if a couple of the segments are story light then take heart from the two that deliver the goods. Metrodome's disc is a sound one, for the interview with Burns and the really interesting making-of featurette – interviews with some of the other directors would have been nice, but we'll manage.